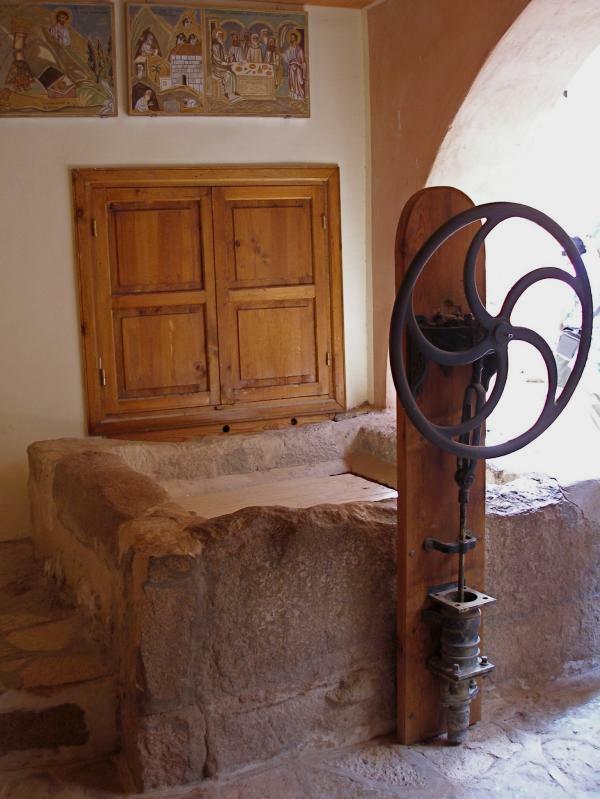 For Western Christians unfamiliar with the rich church decoration and elaborate worship of the Eastern Church, a visit to the Melkite Church of the Annunciation in the Old City of Jerusalem offers a useful introduction. This unobtrusive building — not to be confused with the towering Church of the Annunciation in Nazareth — is the patriarchate church of Jerusalem’s Greek Catholics. 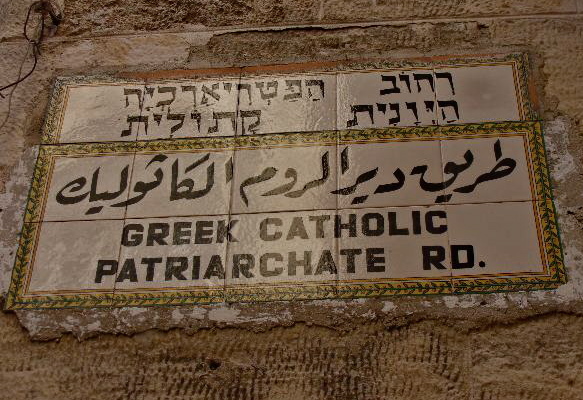 The separate existence of the Greek Catholic Church dates from 1724, when a split occurred in the ancient Greek Orthodox patriarchate of Antioch and a small group chose communion with Rome rather than Constantinople. 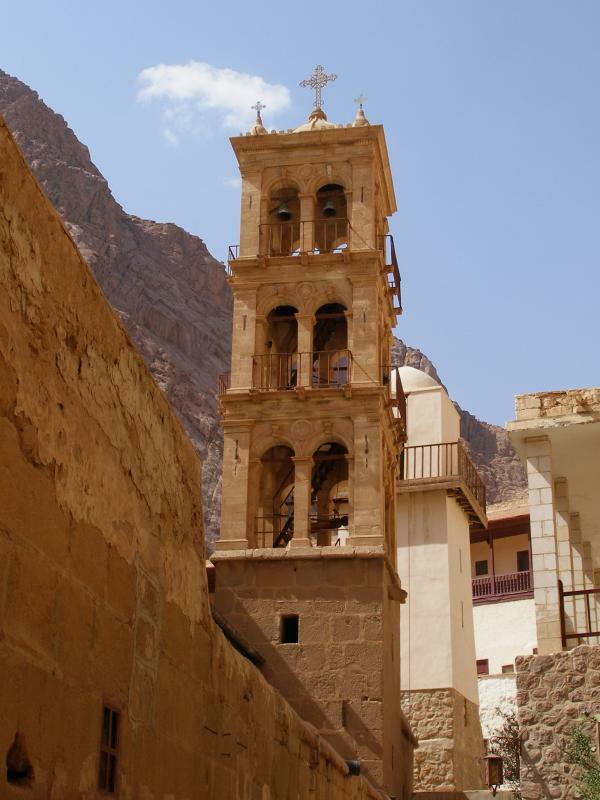 Now numbering 1.6 million worldwide, the Greek Catholics form the second largest Christian church in the Holy Land (after the Greek Orthodox). 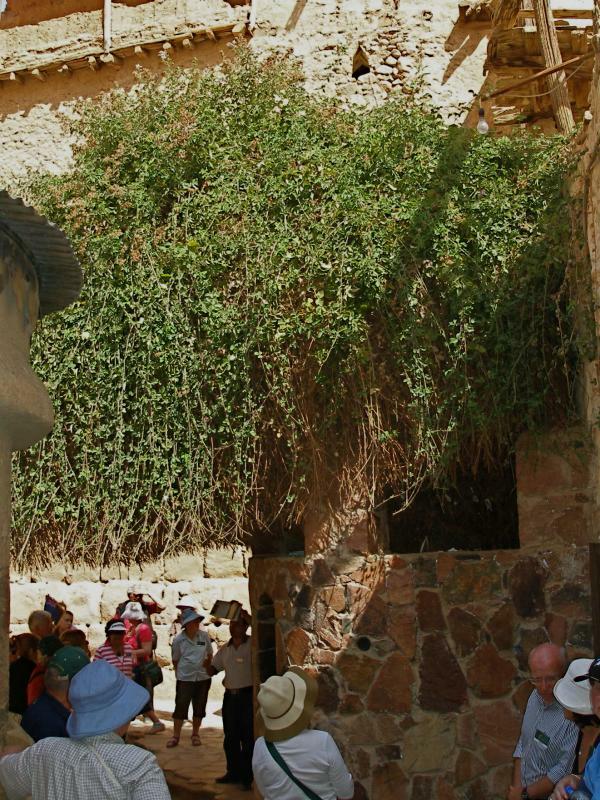 An Arab church, it has big numbers in the Galilee and a small community in Jerusalem. 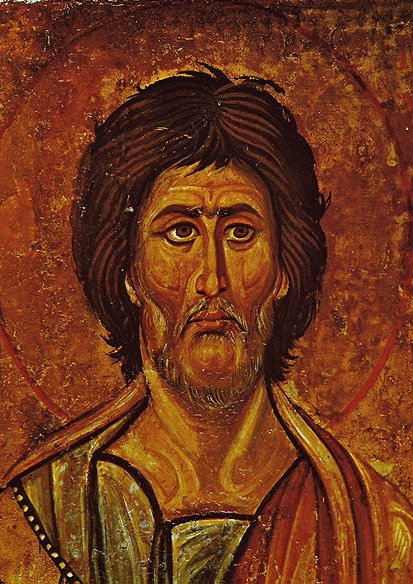 Melkite, meaning “royalist”, was originally an uncomplimentary term applied to Eastern Christians who accepted the authority of the 451 Council of Chalcedon and the Byzantine Emperor. The term is no longer used by the Eastern Orthodox. The Church of the Annunciation, built in 1848, is arguably the most representative Byzantine church in Jerusalem. 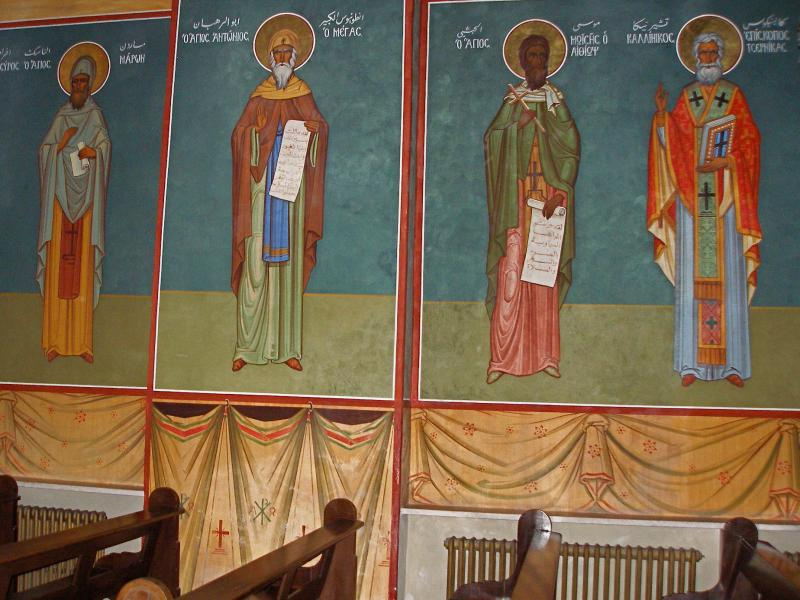 The frescoes, which simulate the stylised motifs of Byzantine icons, were added during renovations in 1974-75. The artists were two brothers from Romania, Michael and Gabriel Moroshan. 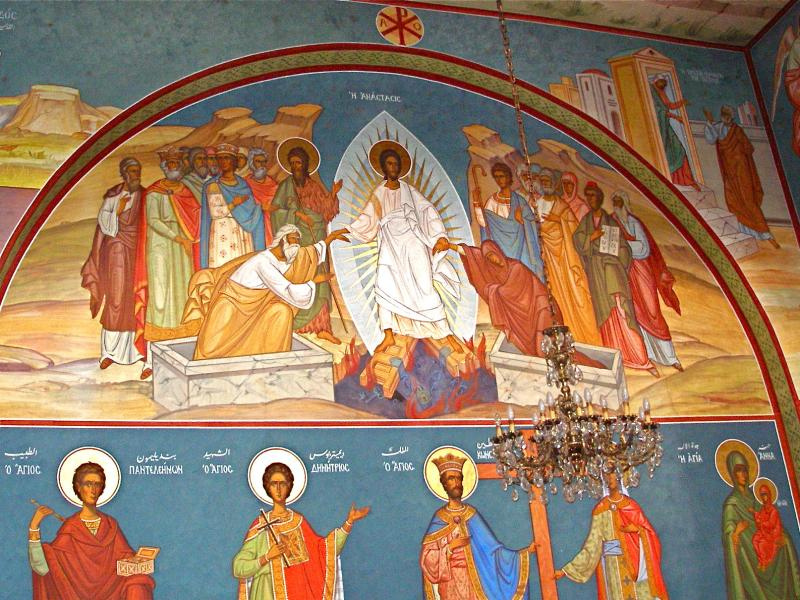 In Orthodox tradition, the frescoes follow a clear theological plan. 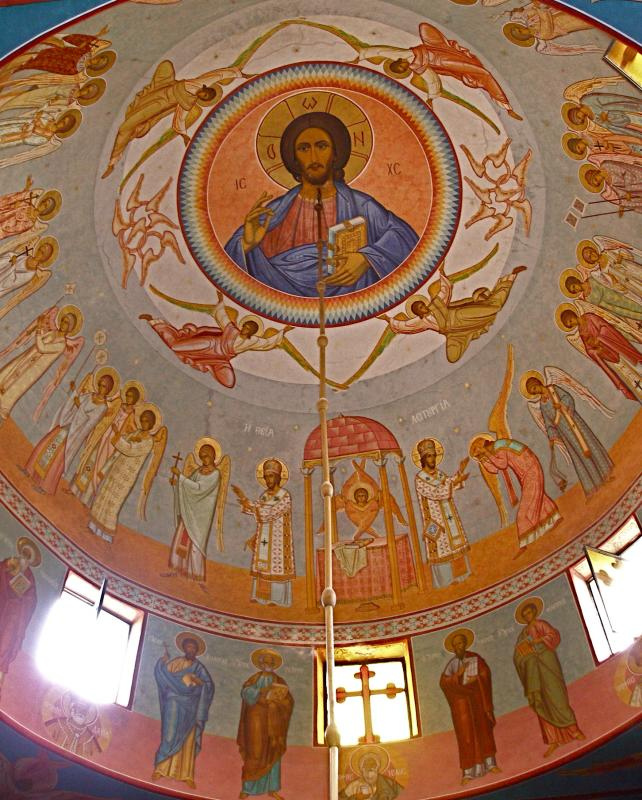 At the top, in the dome, is Christ the Pantokrator, the Ruler of All. Depicted below him, around the dome, are the central act of worship, the Divine Liturgy; the Twelve Apostles; and major prophets and other figures of the Old Testament. From there, clockwise around the church, the entire life of Christ — from the Annunciation to the Resurrection — is illustrated with profound symbolism. Below is a layer depicting saints, to remind worshippers that these holy people are present during worship. “Each scene is interconnected: Take the scene of Christ’s birth, painted directly opposite the scene of the Resurrection. Both symbolise why Christ came to earth. 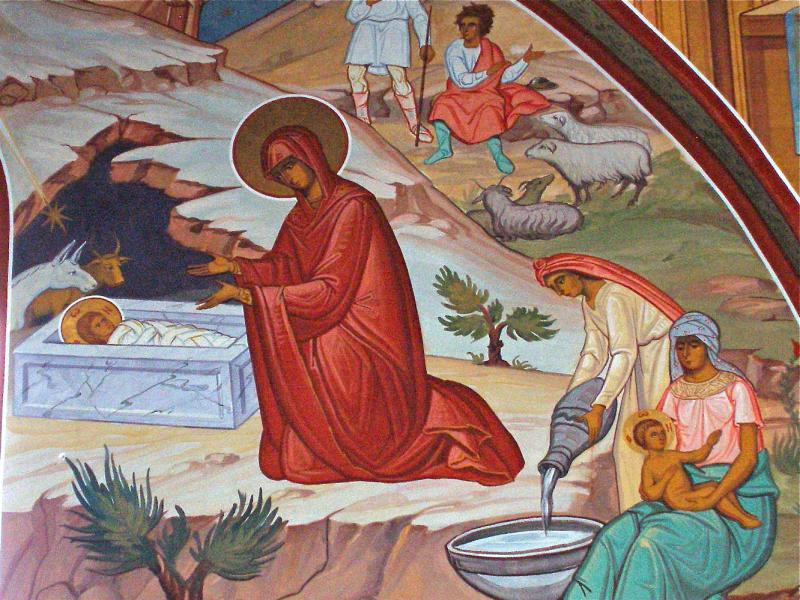 “In the first icon, Christ is born into a stone coffin, a sarcophagus, a symbol of death. His mother is kneeling next to him, dressed entirely in red. “This is unusual: In the East, the Virgin Mary is normally painted in blue and red — the blue stands for heaven, the red for earth — symbolising the one who combines heaven and earth by giving birth to the God-man. 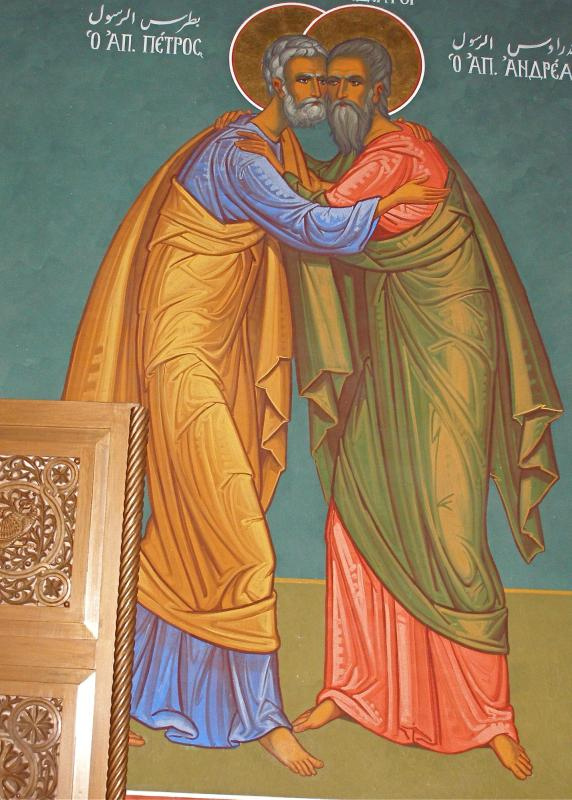 In this scene, however, Mary’s dress is explained by looking across the church at the icon of the Resurrection. “Here Christ is shown standing on the shattered gates of hell in the form of a cross bridging the mouth of hell. He is resurrecting out of the sarcophagus Adam and Eve, symbolic of mankind. Eve is dressed in red, just as Mary was, showing that the first Eve, who sinned, is replaced by the second one who gave birth to Christ who overcomes sin and raises us to life. Powerful symbolism continues around the church. Below the icons of saints, down at pew level, the artists have painted drawn curtains. The suggestion is that, on the last day, the curtains will be pulled back and worshippers will see their own faces glorified. Across the front of the church, the iconostasis separates the nave from the sanctuary. This screen is richly embellished with gilded icons, Christ depicted on the right of the central doors and the Virgin Mary with the Christ child depicted on the left. 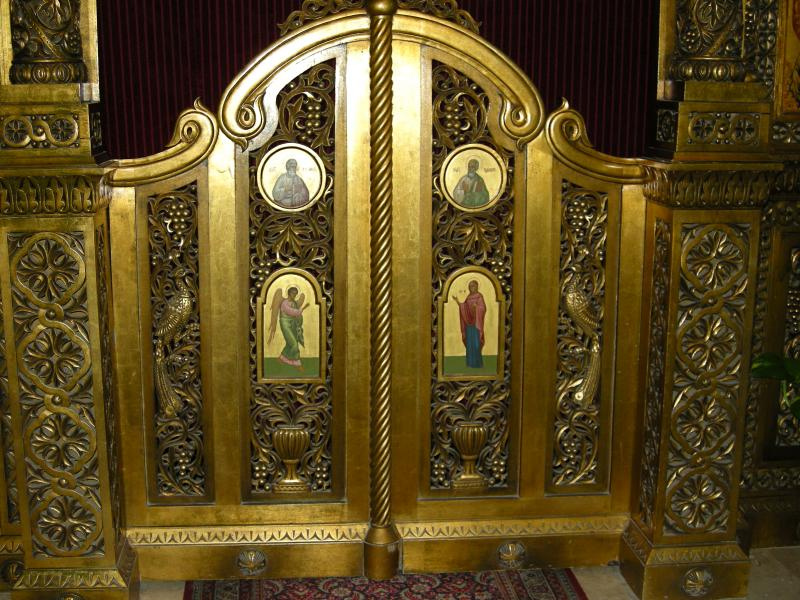 The central doors, known as the Royal Doors, open out to the congregation three times during the liturgy: When Christ comes in the form of the Gospel and a deacon stands in front of the doors to read the text; when the unconsecrated gifts of bread and wine are taken to the altar; and at Communion time when the priest brings out the Eucharist to distribute it to the congregation. As worshippers leave the church, a fresco of the dormition of the Virgin Mary reminds them that they are going back into the world where, inevitably, they will die. Mary’s death is presented as a model for their own deaths as her soul, in the form of a small baby, is being taken to heaven by Christ. 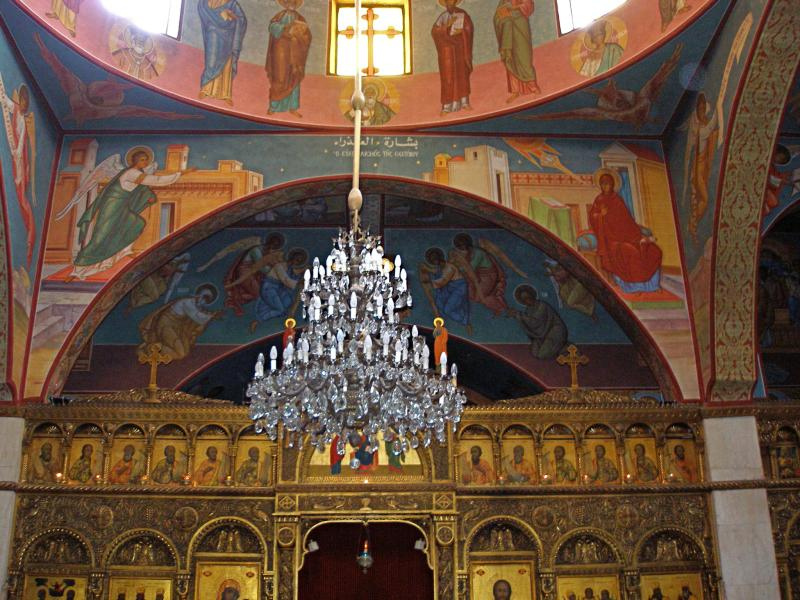 While the Melkites have adopted some Roman Catholic practices, they have essentially retained the Byzantine liturgy and many other Orthodox traditions. 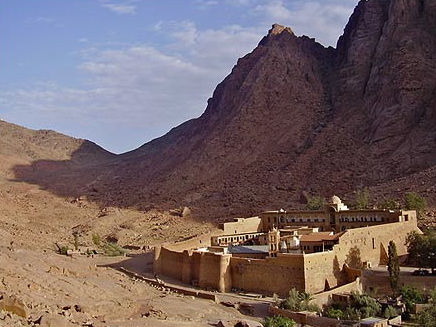 Arabic is the main language of worship. Like the Orthodox clergy, Melkite priests may marry before their ordination. Melkites make the Sign of the Cross in the same way as the Orthodox — forehead to chest, then from right to left, with the thumb, index and middle fingers joined in honour of the Trinity. The other two fingers are pressed to the palm, in honour of Christ’s two natures, divine and human, in one Person. Veneration of icons is a common Byzantine practice, respect being paid not to the painting itself but to the person it represents. Some icons are believed to be the means of obtaining miracles, and people pray in front of them for healing or other assistance. 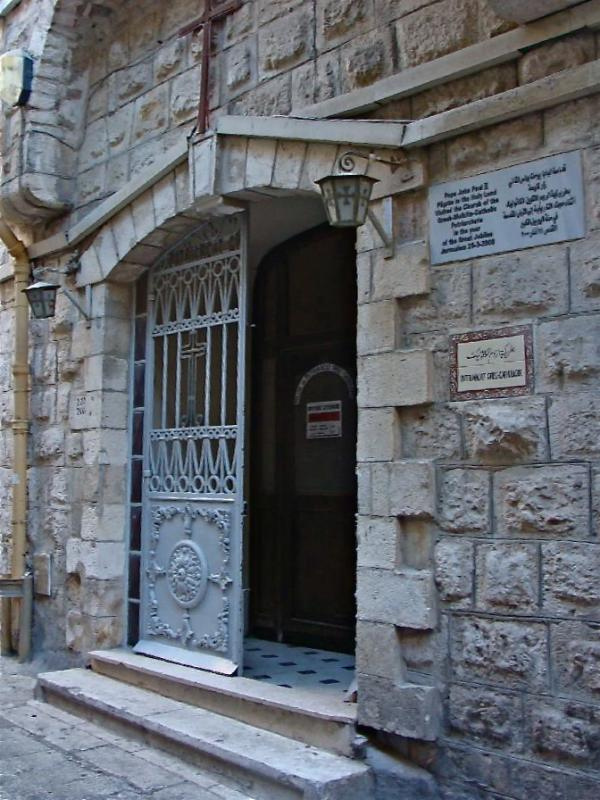 For a sense of the colourful mosaic of Eastern Christian traditions, a small museum in the hallway near the entrance to the church has exhibits of dress, vestments, liturgical items and photos from all of the Oriental churches present in Jerusalem. Open: 8.30am-3pm (sometimes later); services Monday-Wednesday and Friday 7am, Thursday and Saturday 6pm, Sunday 9am. Museum open 9am-12 noon daily (except Sunday) and on request.